Huguette is the winner! Congratulations! Less Hunger. More Energy. Expose your taste buds to something new! Eat chocolate and lose weight? Actually, yes. 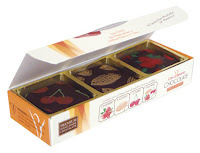 With Celebrate Premium, 100% all natural Chocolates. How does it work? Celebrate's website states, "Joining the chocolate melting across your tongue are Celebrate Chocolate's unique trio of natural plant oils. We add just the right amount of our special blend of Avocado, Macadamia nut, and Hemp seed oils. " "When you savor one or two Celebrate Chocolates about 20 minutes before a meal - when your stomach is not full - it passes more quickly into your intestinal tract. There, as it is digested, along with the natural cocoa oils, it begins to tell your body you are beginning to get full. Somewhere in the middle of your meal you will notice your appetite fading away. As a result, you eat less. Meal after meal, eating less means less weight, greatly aided by the trio of natural oils." I say they taste great! I even let my 13 year old daughter try one. She liked it, too. When I ate a chocolate 20 minutes before mealtime, I did notice that I felt fuller faster, so I ate less. And if I got hungry later, I ate a chocolate, and I soon felt satisfied. What I really love about them is they contain concentrated nutrients from 59 whole foods. They boost your Omega 3/DHA and anti-oxidants. They are also low glycemic for people who need to watch their blood sugar. They have so many products available, you really need to have a look at their site! 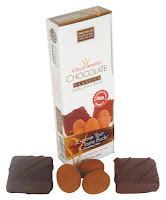 The sponsor, Celebrate LifeNutrition, is giving one lucky reader two sample boxes of Celebrate Chocolates. All you need to do to enter is leave a comment on this post. For extra entries, do any or all of the following. Please leave a separate comment for each entry. Make sure I have a way to contact you. This giveaway will end at midnight on June 12, 2009. Make sure to leave your link in your comment. The winner will be required to give their name and address at the sponsor's website. The winner will add the product to their cart and put in a coupon code. There will be absolutely NO COST to the winner. Details will be sent to the winner when the giveaway ends. This review was brought to you by Family Review Network. MMM CHOCOLATE! This is great! THank you! Subscriber to your RSS google reader style! im in for any kind of chocolate. Ooh these sounds yummy and healthy! Thanks! chocolate...i love chocolate and if it good for me too...what a deal!!! These sounds delicious and good for you too! have seen these around and I am open to anything that would help me drop a few pounds for summer. Chocolate that helps you lose weight instead of gain?! HA! I must try these. Wow this sounds great please count me in! Did you say chocolate !!!! I love chocolate, thanks for the chance!